NEW YORK, Dec. 13, 2011 – The NBA today released its 2011 preseason schedule, a 30-game slate that tips off Friday, Dec. 16, with four games and continues until Thursday, Dec. 22, when two games wrap up the preseason. NBA TV will broadcast at least 10 preseason contests live including Florida’s intrastate rivalry when the Orlando Magic hosts the Miami Heat Dec. 21 (7 p.m. ET), with Marv Albert and Mike Fratello calling the game and Craig Sager providing courtside reporting. For the other games, NBA TV will provide one of the local telecasts. Kia NBA Tip-Off ’11 is scheduled for Christmas Day with five games on the slate. The Boston Celtics visit the New York Knicks to tip off the season at 12 p.m. ET. We then present a double-header when the Dallas Mavericks host the Miami Heat in a rematch of The Finals (2:30 p.m. 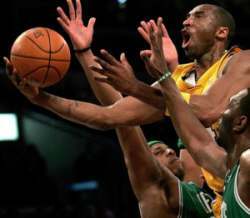 ET), followed by the Chicago Bulls visiting the Los Angeles Lakers (5 p.m. ET). The day rounds off with a pair of games when the Oklahoma City Thunder hosts the Orlando Magic (8 p.m. ET), and the Los Angeles Clippers visit the Golden State Warriors (10:30 p.m. ET).